I’m going to get this out of the way right now: yes, this is one more summer salad recipe. Yes, I eat a LOT of salads in the summer because cooking in a hot kitchen is not my idea of fun. And is it ever a HOT summer over here (I’m loving it, actually). But before you ditch this post in search of something involving ice cream, you should know that this is one of the best salads I’ve made in a long time. I know, I’m one of those over-zealous types who can make exclamations over many things, but this salad freaking WOWED me. I made it on a sunny Sunday afternoon because I had a friend coming over for dinner. Well, not coming over expressly for dinner, but coming over to watch the final 5 episodes of Felicity. Yes, Felicity, the ’90s show where everyone whispered, listened to the dulcet tones of Lilith Fair-style songs, and wore bulky cable knit sweaters. We unabashedly watched the last 5 episodes on a sunny and gorgeous Sunday evening and this salad served as our physical comfort – Ben’s squinty baby blues took care of our emotional comfort, natch. There was also a bottle of Joie rosé which, if you’re curious, goes perfectly with the Ben-Noel conundrum (not that there’s much of an issue here, as it was Team Ben ALL THE WAY). 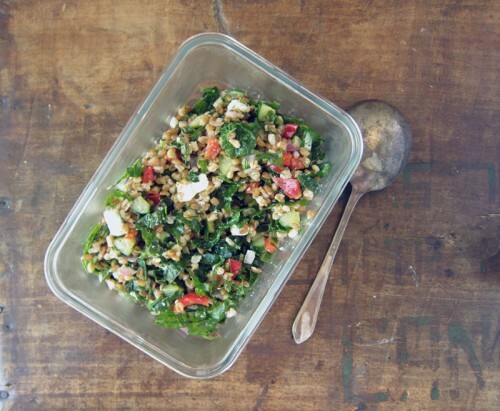 This is a bold and robust salad – full of flavour and bulk. 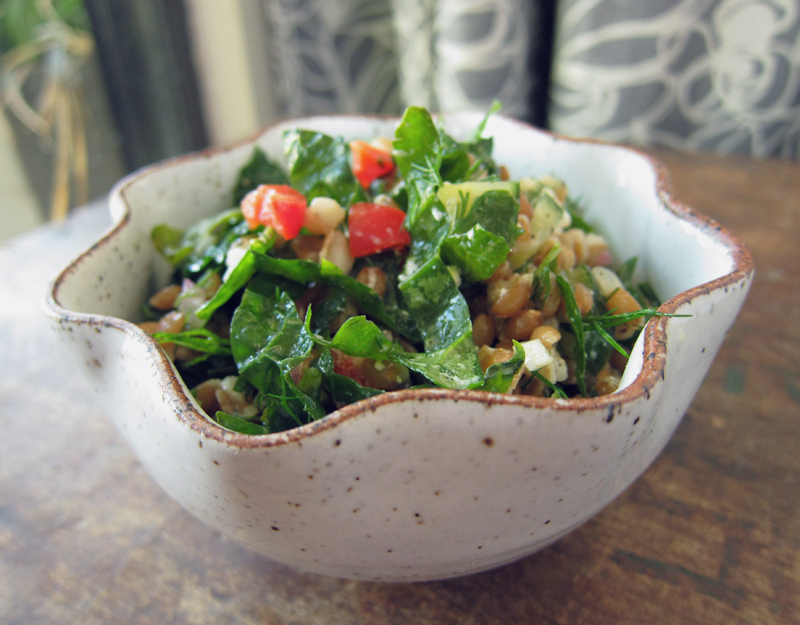 Farro is the hearty grain here and it stands up beautifully to the Tuscan dark green kale. Cucumber, red pepper add a fresh crunch. There’s an abundance of fresh dill present. Go dill or go home I say! Lemon juice and zest dress it all but the real magic comes from the Macedonian feta cheese. If you’ve never tried it before, go out and seek it out. It’s so different from the usual crumbly feta. Instead of feeling salty and crumbly, this feta is creamy and luscious. It came in a clear tub with a red lid (made by Krinos in Canada) sitting in liquid so I didn’t think it would be different from the feta I usually buy. How wrong that assumption was! This cheese feels more like creamy goat cheese than regular ol’ feta. It’s marvellous, so try and find some at your local grocer. And try it out in this salad. Of course, Plain Jane feta will be fine here too. Anyway, I encourage you to give this salad a try. It’s wonderful, perfect for summer picnics and bouts of ’90s television. Cook farro according to package directions, drain if necessary and cool. 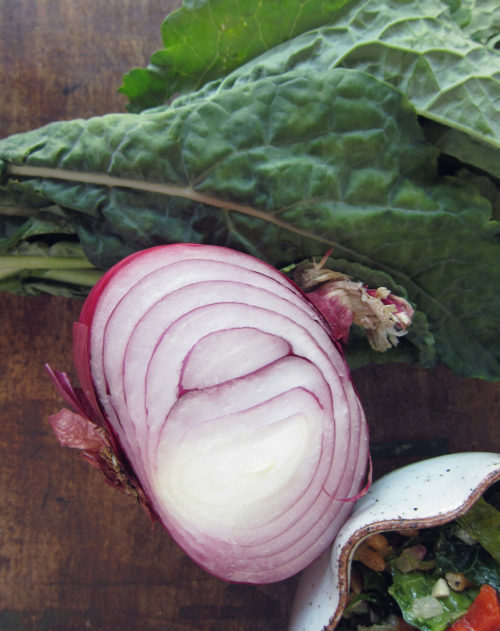 Rinse kale and remove the tough ribs, roll the leaves together into a cigar shape and thinly slice. 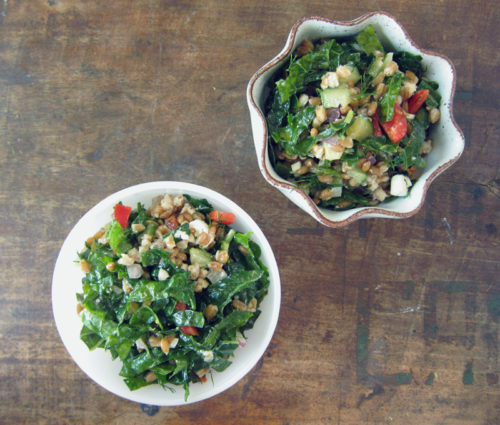 Add kale into a large serving bowl. Toss in the cucumber, red pepper, red onion and dill along with the lemon zest, juice and olive oil – and salt & pepper and feta – until everything is well coated. Let the salad rest for 30 minutes before serving. Keeps well for a day or two in the fridge. This salad looks awesome and suddenly I want to go back and watch every episode of Felicity! Sounds like a super tasty salad to me! And I had a compulsion to rewatch Felicity not too long ago…maybe I should have actually followed through! I thought “oh, yum – I’ll make this salad for my barbeque this weekend!” then I thought “forget about the barbeque – I want to watch Felicity!”. Joanne, it’s never too late to re-watch Felicity!! Haha, love it, thanks Megan! I eat tons of salads in the summer, too. Turning on the oven just isn’t appealing at all. We’re actually having a cool spell with lower humidity and beautiful temps, but I’m still in a summer mindset and not turning on the oven, ha. This salad looks wonderful! I’m going to look for Macedonian feta, it sounds dreamy! I rewatched Felicity last year or the year before and I became hooked all over again! I realized I stopped watching the show sometime around the haircut and not because of the haircut, but because my school schedule changed. I didn’t realize how many episodes I missed! The ending was so weird yet great. My younger self loved nerdy Noel, but my current self is totally team Ben. 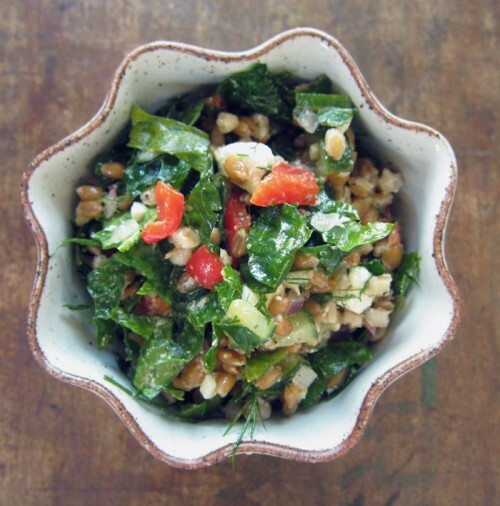 This is a great salad, love adding grains and veggies together. Another great salad creation! I love dill in salads. Speaking of dill, I think you might enjoy “maroulosalata.” It’s a Greek salad that uses fresh chopped lettuce, scallions and lots of dill, olive oil and wine vinegar or lemon juice. 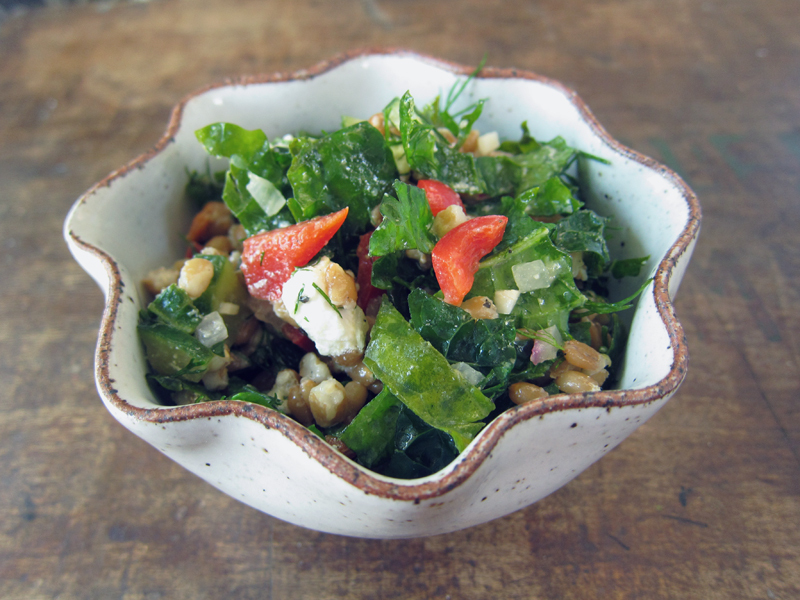 Macedonian feta is a type of feta from the northern region of Greece. I buy Krinos feta here in the supermarkets but I haven’t seen the Macedonian variety in stores. Just some trivia on Greek feta: Did you know that only Greece (and international Greek cheese manufacturers) have the exclusive rights to call their cheese feta. See article below. 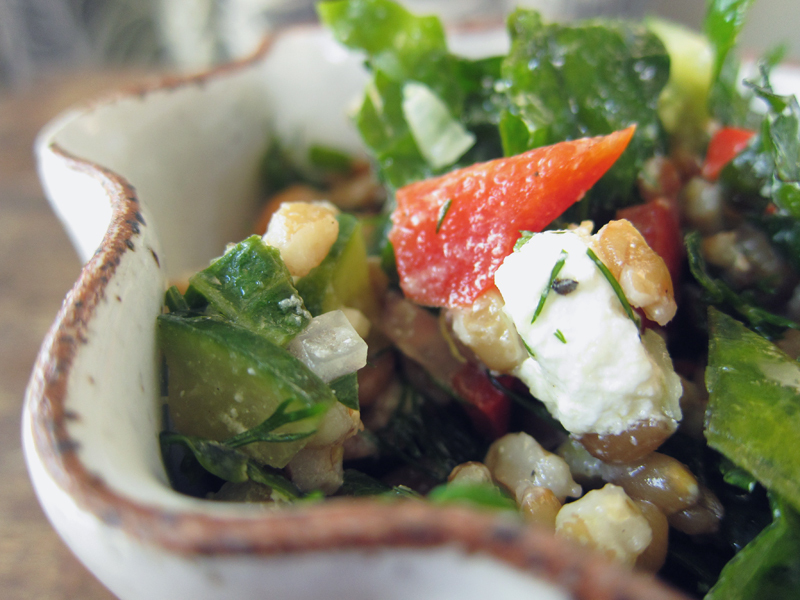 Yes, look for Macedonian feta, it’s a delicious thing. Oh Felicity!! JoanneM, thanks for the salad rec – I’ll try to recreate it as it sounds delicious.